This report illustrates a living wage for workers in the garment and textiles industry in Tiruppur City, Tamil Nadu, India. This report illustrates a living wage for coffee sector workers in rural Guatemala. 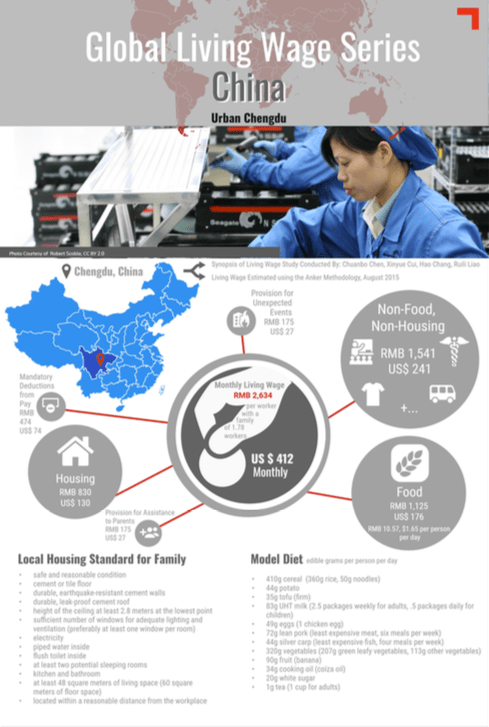 This infographic illustrates a living wage for workers in urban Suzhou in China. This report estimates a living wage for workers in the manufacturing industry in urban Shenzhen in China. This infographic illustrates a living wage for workers in urban Shanghai in China. This infographic illustrates a living wage for workers in urban Hangzhou in China. This report estimates a living wage for workers in urban Chengdu in China. This report estimates a living wage for workers in the banana sector in the Lower Volta Area in Ghana. This report estimates a living wage for workers in rural Vietnam with a focus on the seafood processing industry. This report estimates a living wage for workers in urban Vietnam with a focus on the garment industry. This report estimates a living wage for workers in the horticulture sector in non-metropolitan urban Ethiopia. This report estimates a living wage for workers in urban and rural Pakistan. It focuses on the sports ball manufacturing industry. This manual describes a new methodology to measure a decent but basic standard of living in different countries, and how much workers need to earn to afford this. The manual makes it possible for researchers to estimate comparable living wages around the world and determine gaps between living wages and prevailing wages, even in countries with limited secondary data. This report estimates a living wage for workers in the rural Mount Kenya Area. It focuses on areas with a concentration of fresh-cut flower farms. This report estimates a living wage for workers in the rural areas of Eastern Uttar Pradesh in India. The report focuses on areas inhabited by workers of the carpet weaving industry. This report estimates living wages for areas of Dhaka and its satellite cities with large concentrations of garment factories. This report estimates living wages for the Minas Gerais State of Brazil with a focus on coffee production. Minas Gerais is the most important coffee-growing area in Brazil – the most important coffee producing country in the world. This report estimates a living wage for Kenya with a focus on a fresh-cut flower farm area near Lake Naivasha. This report estimates a living wage for rural Malawi with a focus on the tea-growing region in Southern Malawi. This report estimates a living wage for rural Dominican Republic with a focus on the banana-growing region in the Northern part of the country. This report estimates a living wage for the wine grape-growing area of the Western Cape Province in South Africa.